New to all of this but feeling ambitious. I've got some solid ideas of what I want to build, just need to figure the best way to implement. Looking at the DMX config files, it looks like Artemis' implementation seems to generally assume a 3 channel RGB output. If I'm hooking up (via Arduino) to a general RGB strip, this would work wonderfully and simply it seems. I'm definitely more interested though in doing things with the individually addressable lights, and being able to drive them from a single output data link from the Arduino. Strip of 10 lights gives me 10 individually controllable lights. But it doesn't seem that DMX understands this? or at least the way that Artemis implements it. I'm wondering what is actually happening over the serial link here. 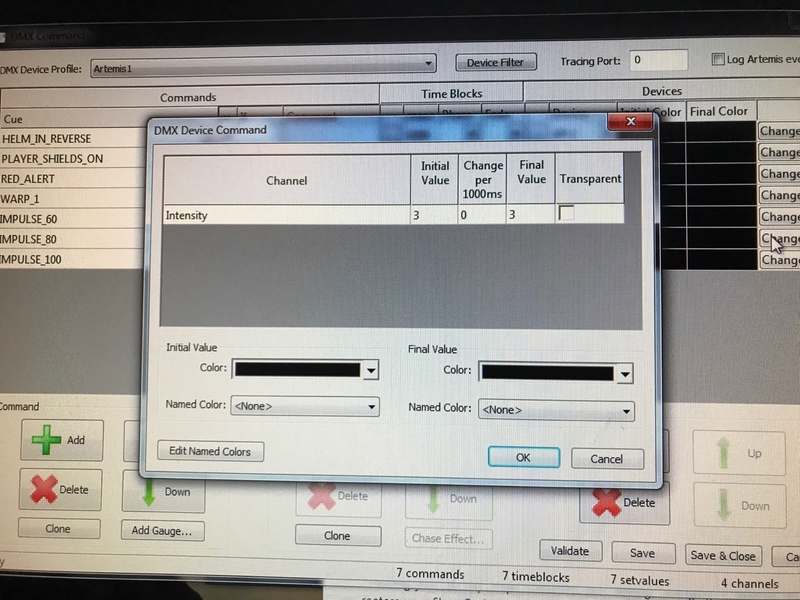 My interpretation (don't have anything plugged in yet) is that the serial RX on my Arduino will receive 3 'channels' via the DMXlibrary. I'll get a value on each channel representing the color. But there's not enough here to tell my 2812 what to do on an individual light basis. What do the various fields in this DMX event represent? Specifically <timeblock seconds="xyzzy"> and the "change" field in the set value commands? Is this defining a rate of change over a period of time? I'm thinking at this point, that its going to be easier for me to just rewrite the DMX config items to represent a more general transmission to the arduino - instead of reading the values that DMX wants to send, have it instead some kind of discrete indicator, that the Arduino will then read and trigger a function and do all the color and activation work on that side instead. - This will never work so I should stop before I jump off a cliff of disappointment. 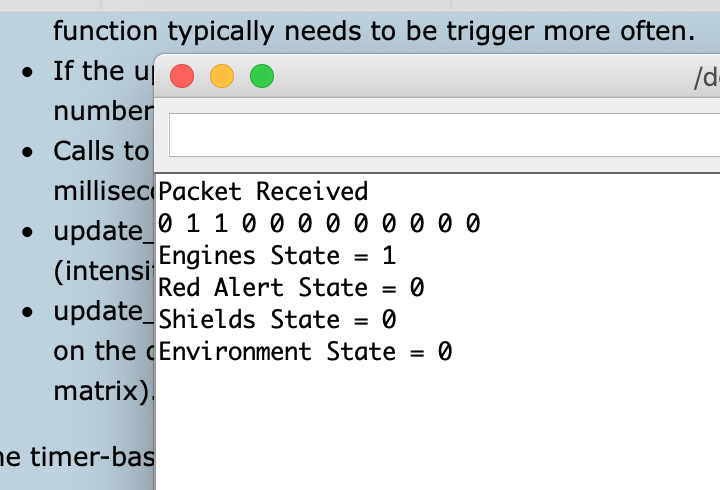 I haven't seen any documentation for Artemis that explains what the signaling it doing, so I'm definitely guess here. Any ideas? I'll definitely share what I discover after my RedBoard comes in (combines an Uno with an FTDI chip, so best of both worlds) I'll probably set up a serial write and try to capture what signaling comes across and try to reverse engineer that to decipher Thom's implementation in Artemis. Actually now that I'm thinking of it - is the formatting and usage of the DMX config file a general standard? That code block I posted in the previous one?I'll dig around and share what I find. Haven't been able to play with the receive side yet, but having some fun with my test strip, creating cool effects. 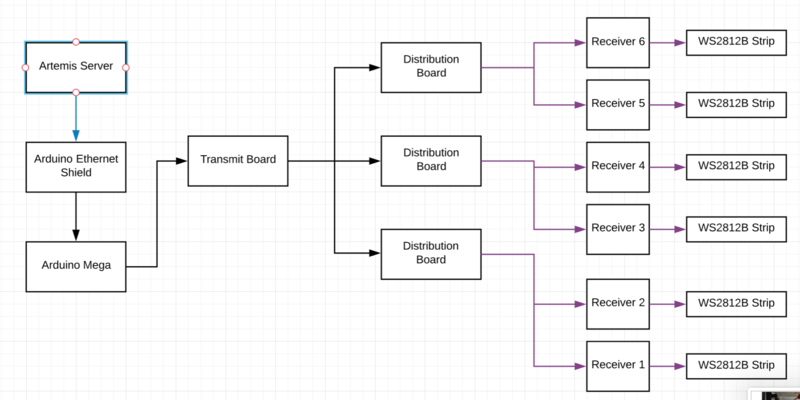 My thinking now is that I'll set the Arduino to read the inbound signaling packets, and look at things as an on/off per channel, with each channel representing a different action. 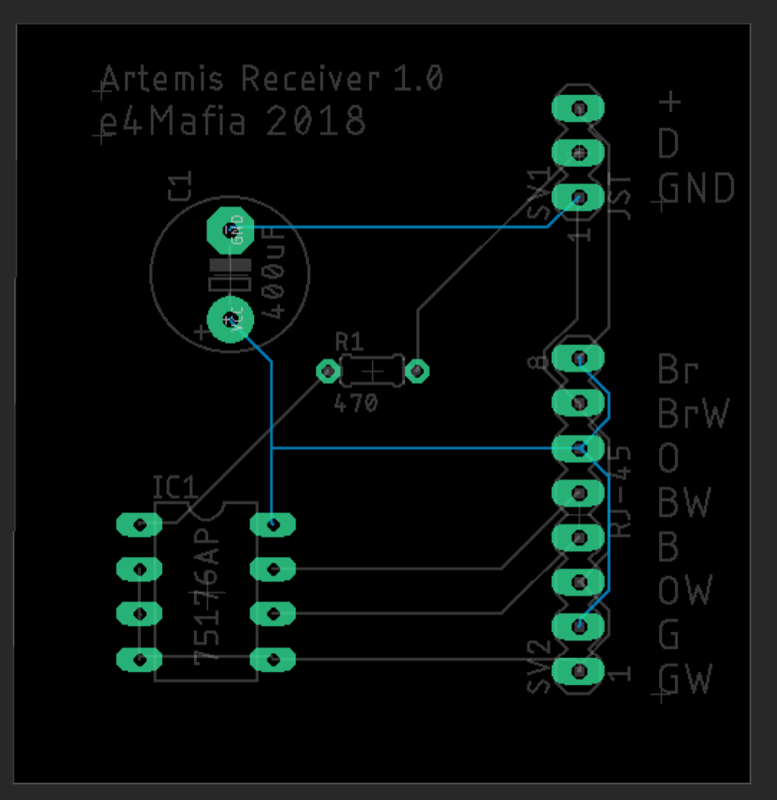 Kind of translating the Artemis event into a discrete channel signal on/off to the Arduino, which will then use that signal to begin, or stop a given function. It seems like this will give me much more of what I want than just live feeding the channel values over and translate them there. In that case, I'm stuck having to program the effects in the Artemis config file, but I'm just not really seeing how to do more elaborate things that way. Maybe I'm just missing the forest for the trees? Shields Up --> Steady value of (channel/value) = 0/1. 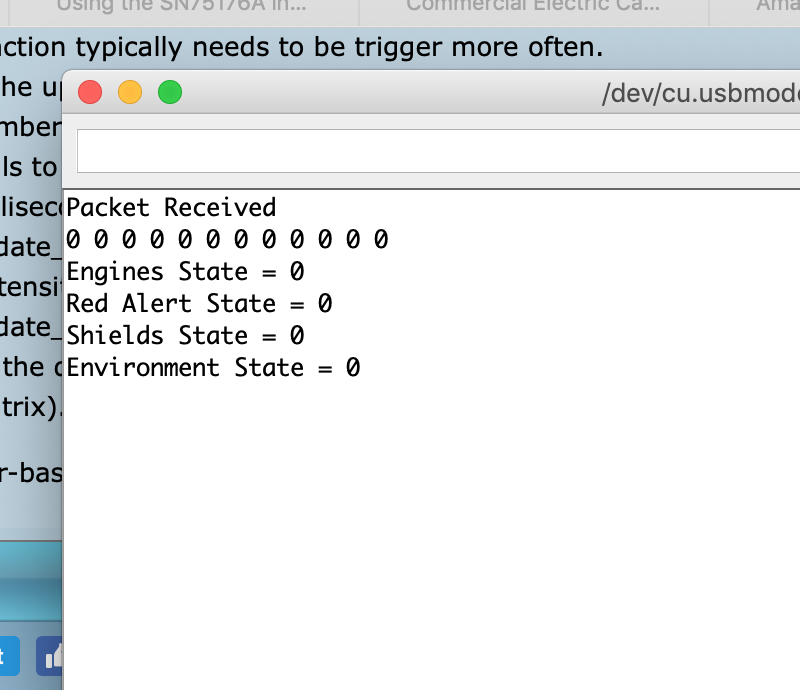 -->Arduino runs a loop of the shieldsUp() function which will do a wipe up of blue lights. Shields Down --> Steady value of 0/0 -->Arduino now stops running the shuieldsUP() function. Uh oh, I think I may have cornered myself already. Can you multithread on an Arduino? It sounds like you've been working out the details of your light control scheme. As you noted earlier, there is a choice to make between how much programming you want to do with the script vs. how much programming you want to do with the Arduino. Since the Arduino approach offers more flexibility, especially with respect to logic, it's been my preference to do the programming there. The sketch has a number of global variables to keep track of the active animation states and their progress. One common structure I use is to have a 1-dimensional integer array, with one "row" for each one of the possible animations. The row stores a "-1" if the animation is inactive and stores a positive number to represent the "frame" of each animation. The main loop calls a number of functions, including a function ("update_animation()") to advance to the animation frame, and a function ("update_lights()") to update the LED hardware. These two functions are separate because the update_lights() function typically needs to be trigger more often. If the update dmx function on the Arduino detects a change from Artemis, it can be programmed to enter a "-1" or a frame number into the array to start (or stop) the animation. Calls to update_lights() or update_animation() are triggered from an "if" statement that checks a timer. If the right number of milliseconds (or microseconds, according to taste) have gone by, the corresponding function is called and the timer reset. update_lights() updates the actual hardware states (either via the PWM pins or normal digital pins, according to taste) based on the data in the lights array. This scheme is only needed if there is any hardware overlap between lights (such as an LED matrix). The timer-based coding method above allows the Arduino controllers to do many different things at the same time. I'll walk through my programming process and share the code. 2 strips, one on either side of the main screen, for the captain to have a quick visual on the shields and energy status. The right strip will show energy like a gauge, with the color shifting from yellow to orange and red in addition to turning off 1 light at a time from top to bottom. The left side will be shields, as a gauge extending up for front shields and down for rear. They will retreat toward the center of the strip as the strength weakens. 2 Strips, either overhead or on the sides of the play area, to give a sense of motion. Yellow chase lights for impulse, with increasing speed of the chase effect to match impulse rate. Turns purple and does same for warp. Working the idea of having a different animation for impulse, but for now its just a different color. 1 strip centered above play area for environmental effects - soft green for in nebula, yellow pushing when docked, etc. Will also handle flashing and other damage indicators. As you can see, its a lot going on. Easy enough to do in C++, but I'm completely lost as to how I'd pull it off in DMX only. So how do I translate the DMX output into something more useful like "turn this on, this off" instructions? Easy enough. A channel for each strip, and either a binary 0-1 result for on or off, or a menu of options like 1-4 for the warp speeds. OK. So into DMX tools I go and create a multi-channel ARTnet device. I leave the single channel of brightness in as 0-255 for flexibility, but remove the RGB channels as they aren't really needed. Each of the impulse levels will output a single number. So the bones are there, now its time to go over to the arduino and see what gets sent. 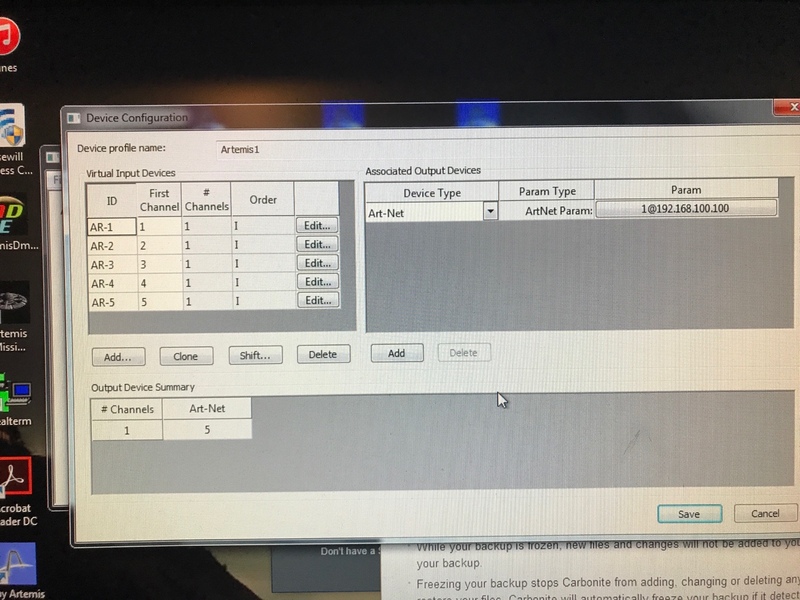 I have the serial monitor set to print the data in each channel left to right, starting at channel 0. Which thanks to some WireShark investigations, I learned resides in byte 18 of the buffer. Right now it will print bytes 18-30. Why up to 30? Why not. I may end up using more channels, and I'd like to be able to see them quickly for debugging purposes. Ignore the shields state output. I need to update that. The byte print out above Is accurate. Engines are in byte 19 and shields in 20. The bottom print is off. Many segments of the code are straight up lifted from there, and then modified a bit. //manual MAC address of the ethernet port on the Arduino. I've omitted the code for the light object class, which includes the functions for each animation, and update function, and a timer function to check if enough time has passed to go to next animation step when update is called. If it isn't time, the update ignores the effect. All of that is heavily derived from the NeoPixel article referenced above. Next problem is how the heck to do I get the crappy 5v signal out to the lights if they are upwards of 15 feet away? Well cat5 cable seemed the obvious choice to me, since I could use it to carry signal, AND power for the LED strip. Only problem is the degradation of the control signal from the arduino at that distance. In steps the SN75174 and SN75176 transceivers. They will transform that single 5v signal into a differential pair of signals (good thing I have twisted pairs of wires handy 😉 ) . So 4 of the light control signals go out on the 4 channels of the SN75174. The remaining signal will be split to two lines and travel from an SN75176 in transmit mode. 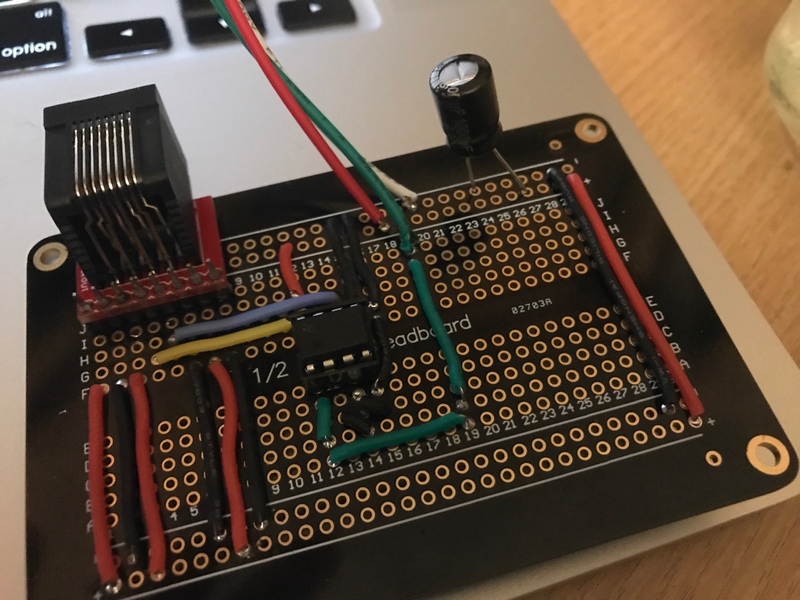 Each of the LED strips will then be connected to a control receiver box, from which it will get power, and the data signal, which is turned back into a single 5v single by the SN75176 on the board. I haven't built the main control board which will send out all the signals yet, just 4 of the 6 receivers. All of this will be powered by an ATX power supply in an old computer case I pulled out of the basement. The control board, and power distribution will live inside that case as well. When everything is all said and done, I'll post a parts list, schematic, and put the finished code on GitHub for everyone to use. I want to thank everyone in this community for inspiring me (especially Angel of Rust) to take on this project. I've never used an Arduino before. My background is a network engineer, but for a time I was an avionics and weapons tech in the army, working on Apache helicopters, so much of my knowledge there came into play here, but most of this has all been learned on the fly. I've really enjoyed this so far, despite some of the heavy bugs I've come across in the hardware and code as I've gone. Hey Angel of Rust or anyone else that knows anything about PCB design.... any advice on design? I tried creating an account over on Fritzing to ask someone to sanity check what I've done, but their sign up process is messed up. (Captcha not working). So I went full bore and DL'ed a copy of Eagle. Took a while to get the hang of it, but I like it. I see that you made a few PCBs for your control panels, wondering if you wouldn't mind weighing in with an opinion on mine? SV2 will be connected to an RJ-45 cable, which is carrying the signal for the SN75176 on pins 4 and 5, and +5v and - on the other pairs. 1, 3, 7 are - and 2, 6, 8 are +5v. Each + and - are on a twisted pair together. SV1 goes out to the light strip. I couldnt figure out how to move the pins on the schematic, so its a little bit messy, but it translated nicely on the PCB. Here's the schematic for the receivers, for anyone interested. I'll try to find other sources for help with the design before I order it. It'll will sure beat wiring up the boards manually - too many easy mistakes to make. Hey Angel of Rust or anyone else that knows anything about PCB design.... any advice on design? I think the overall design looks good. 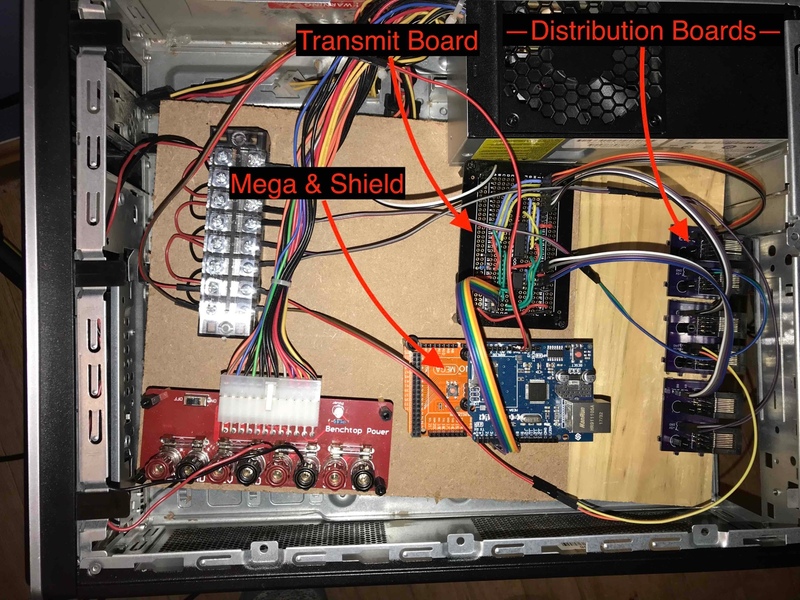 If I understand your previous post correctly, you have built a breadboard prototype and verified that the design is working. That is good. I couldn't tell if each of the receivers needed to be individually addressed, or if each one has its own control signal from the main controller. If you could speak to that point, it would help to understand. The arrangement of the PCB looks like each board gets its own signal. SV2 appears to be designed to mount the RJ45 jack on a separate breakout board that has the 8 pins arranged in a line. If you haven't already bought the breakout boards, you could consider mounting the jacks on the PCB directly using the two staggered rows of pins that are typical for RJ45 jacks. No matter how you choose to mount the jack, you will likely want to make sure it is located entirely over the board so it is less likely to move when plugging and unplugging the cat5 cable. the VCC trace seams a little too close to the other pads on SV1 and SV2. Since you have a lot of room to work with, I recommend increasing the separation between them. It will make accidental shorts less likely during assembly. I did already have the breakouts for the RJ-45. I didn't even think to do a staggered series of holes in Eagle, my brain was locked on the fact that I couldn't do that on my breadboard. If I do another run, I'll do that. Could have saved 5 bucks on breakouts 😉 - I guess v 0.2 will not need breakouts for the jacks. tightened it up and got rid of a lot of extra space. forgot about mounting holes. Thats a really good idea. I have a friend who's gonna 3d print some small enclosures for me, so its not quite so important. Gonna try to use a slot to mount in place. I tried to figure out the ground plane in Eagle, but gave up after a bit. Maybe worth another look. Total voltage moving through the non power lines will be 5 volts, and very low current. The lines to SV1 will pull up to a theoretical 3.6 amps, but in practice will be much less. The only lighting effect that uses all the LEDs at once is red alert, and some other environmental effects, but they wont ever be on at full bright, and not for long at that. Maybe a few flashes of white for damage effects, but sustained higher current shouldn't be a problem. I could also just run dedicated, thicker traces to those lines right? 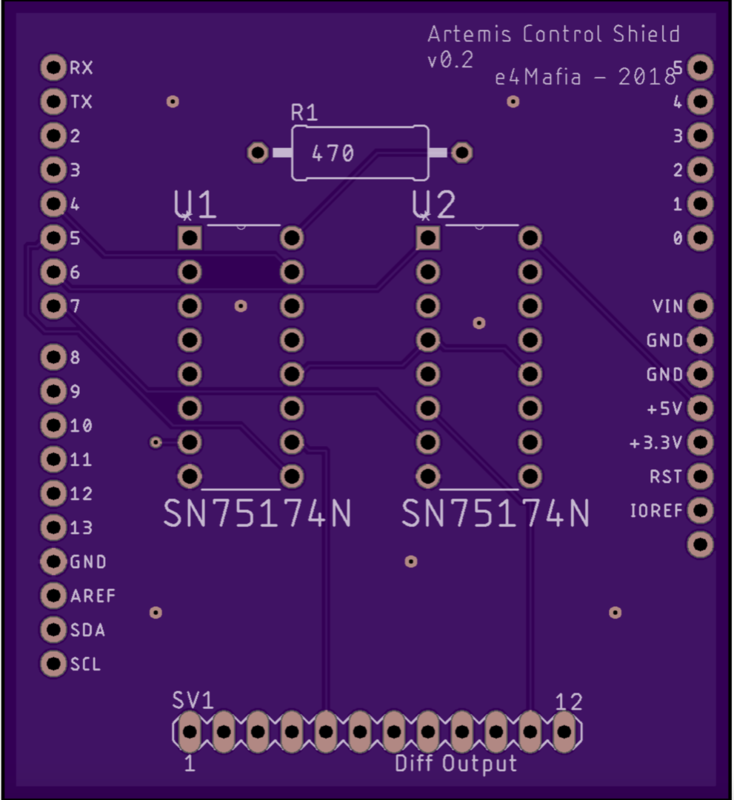 Gonna go take another pass at this one, and also the control board, which I just realized would be a hell of a lot simpler to build as a shield on the arduino, rather than screwing around with connectors and such. Just found the Eagle template for one, Yay! First round boards are back. Like a dope I mislabeled +5 and gnd, so when I first hooked ip up, not much happened except a shitload of heat generating on the jst whip. Figured it out and swapped, and it works like a champ now. I wish I had put more space between the holes for the resistor, and used a natural footprint for the rj45 rather than mounting it onto a breakout and then the breakout to the board - but everything else is pretty hunky dory. To say I've learned a lot from this is an understatement. And now in fine myth busters fashion, I'm feeling the "if its worth doing, its worth overdoing" bug, and wanting to build out nice neat boards for everything to really clean this thing up. But of course that's more money. I didn't get all of the lighting effects to do everything I wanted. I guess thats what a 2.0 code rev is for. But for the 1.0 version of hardware I am very happy. The Arduino's network connection is really flaky, and I sometimes have to reconnect power a dozen times before it comes up, once it does, we're cooking with hot fire! he receiver boards work perfectly. The transmit board is 100% as well. I didn't do a PCB for that yet, since I've only got the need for 1 of them, but my OCD overdo-er is telling me at some point I'll PCB that one too. The distribution PCBs also work well, but I think there's a minor physical flaw in the location of things in terms of wire routing in the case. Something to think about for V2. Heres a block diagram of how its all worked together, along with some photos for your enjoyment. I'll post the finished code after the weekend and push it to Git for everyone to have to do with what they please. Block Diagram of Signals. Power is also sent to receivers via the distribution boards. Components in the case....some creative rigging to get it all to stay in place. The vertical pins for power on the bistro boards, I'll probably remove and just solder direct tot he boards, but leave the other end as a disconnect-able line. Eventual PCB for the transmit board. Learned a lot, the event was a success. Not without problems of course. Nearly melted some wires at the very beginning not noticing a short on my lighting controller. Might only be 5v, but that ATX power supply has a lot of Amps to push over those tiny wires! Wifi there sucked, so we ended up needing to switch to wired, but had to "order out" for a switch and a bunch of cables. Should have planned ahead for that. 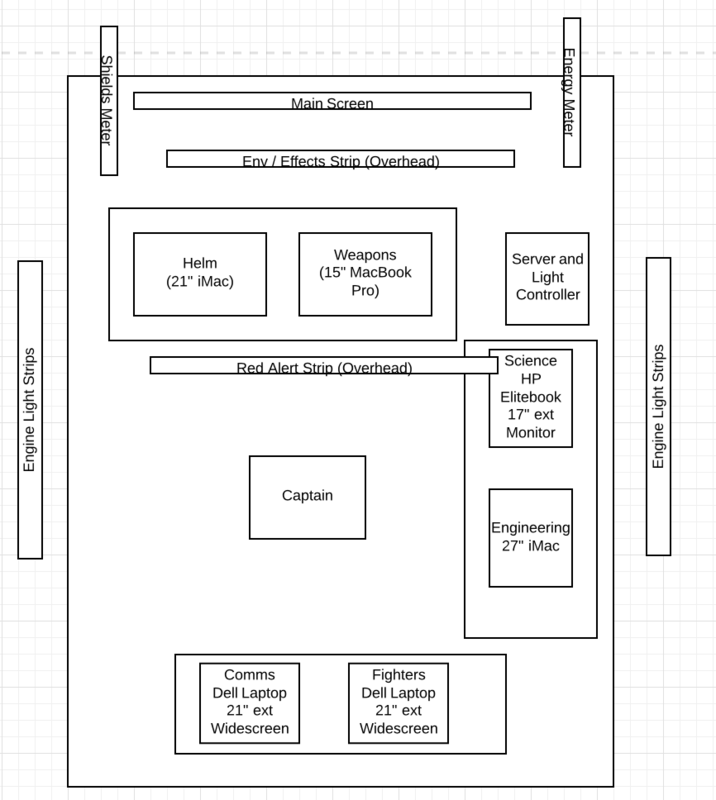 Rationale for the setup was Comms behind the captain, so they were close for constant interaction, and science next to weapons for the info sharing there. Engineering where it was with a big monitor so the captain can see at a glance what's up over there. My DMX setup for the energy meter needs a little work, as the output is a little wonky. The code on the Arduino for outputting the effect to the WS2812B is solid though, so there's half the work done already. I want to add 'static' like effects to the shield meters when a hit is taken, but haven't quite figured that one out yet. Where to go from here? The Arduino Mega I'm using has a LOT of outputs, so maybe strobe lights, smoke machines, a klaxon....who knows? Anyone have any cool ideas? Look cool! Thanks for sharing all the details. Do you have some photos of the setup in action? Now I need to justify to myself buying a full compliment of laptops or all in ones to have a fully useable on-demand bridge for events. 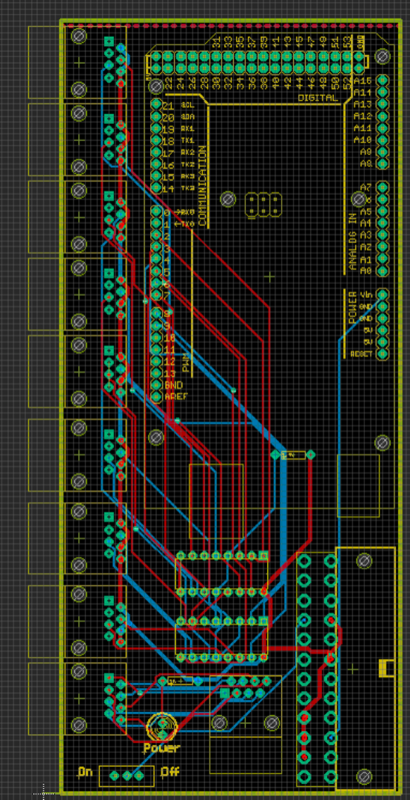 In the process of drawing up a new, more efficient PCB for the whole thing. It will plug directly into a standard 24 pin ATX power supply, no modifications needed, and will handle all power distribution and data signals out to the ethernet jacks. Should be able to support 8, which is 2 more than I'm using right now. So conceivably, it could power 2 more LED strips, and/or any other devices that could be data controlled by an Arduino, and need 5v or 12v power. (I'm thinking strobe lights ,smoke machines, rotating siren style lights, etc) Interesting thought is to put switches on the board to be able to swap between 12v and 5v to the individual output lines for power. The ATX supply outputs both, so I've got both right there. Anyone have any thoughts there? I'll have to order 3 of them (that's the way OSH park works), so if anyone is interested, I'm happy to sell one of the extras. 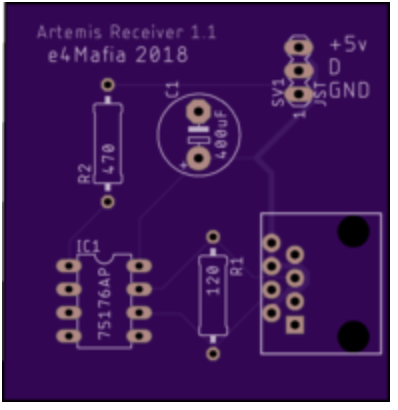 (I'll keep the second as a backup spare) I'll provide a components list and the schematics too, along with a link to the receiver board for the LED strips, and the code for everything too. I've really enjoyed working on this project. Customer controls like Angel of Rust did may be next on the horizon for me. Can't stop the train once it gets rolling! - the ethernet ports all need to be on a single side, facing out, otherwise I need to build a different case, and I'm pretty partial to the mini ATX computer case I'm using now. I guess making a custom sized out might be a big help, as I could then put the rj45's on both sides.....things to think about. Right now it has 8 x rj45 outbound to the lights, 1 x rj45 inbound to the ethernet shield on the Arduino. Theres an internal rj45 that connects to that one so that I can jumper to the shield without having to run a cable into the case, and instead have it nice and neat terminated on the back panel. 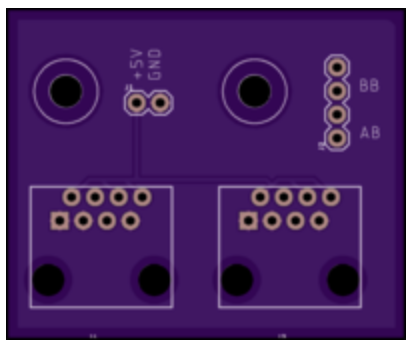 Right now its about 3"x6.5", which makes for a somewhat steep cost to run at oshpark. Anyone come across any alternatives that are cheaper? Not that its necessarily better to go that way, as I'm very happy with what Oshpark has put out for me so far.